Admittedly, I did make this Braised Pork Roast with Sausage & Cabbage a couple of weeks ago and I gotta say it really hit the spot on that snowy Spring day, too. Just make it any time you want your kitchen warm and toasty and want to have your belly filled with utter deliciousness. I think this Braised Pork Roast with Sausage & Cabbage is one of the best dishes I’ve made so far this year! Maybe even one of the best dishes I’ve made in a long time. The ingredients are so simple, it caught us by surprise how much we enjoyed it. Child number 2, Kraig & his girlfriend, Tweety were over and we all just went a little cray cray over this dish. And then we sat bemoaning the fact we ate so much as we continued to eat more! The pork is cooked until it’s caramelized and browned and soft and delish, but the sausages really stole the show. I used a smoked bratwurst and I think it’s the first time I’ve ever cooked sausage like this, literally for a couple of hours. They were absolutely butter tender and there was that magical alchemy that happens as the sausages picked up flavor from the dish and exchanged some of theirs in return. I figured a package of the sausage would be enough (they come five to a pack, here), just kind of a little taste per person since there was so much else in the dish, but you’ll probably want more – we did! I’d recommending stuffing in as many sausages as you can fit into your pot! And then stuffing as many of those as you can fit in yo’ mouth! The cabbage wilts down into the sauce to just about nothing and the potatoes get very tender as they absorb all that winey goodness of the sauce. You can serve this with some of my Creamy Horseradish Sauce or some grainy mustard; either would punctuate those long-simmered flavors, but it’s just as good as is. In the end, we didn’t bother with either! A good hunk of bread might have been nice or maybe some rolls if you’re the kind that wants to drag something through the sauce. Hey, it’s a peasant type dish – that’s perfectly acceptable! Braised Pork Roast with Sausage & Cabbage is drop-dead simple to make! It’s so good, it’s hard to believe how simple it is and how great the flavors are! I think it’s the wine. 🙂 I used Sauvignon Blanc, my go-to for cooking when a white wine is involved. Do be sure to keep the potatoes in large chunks. They’ll be very soft and in danger of disintegrating if they’re smaller; I leave the skin on and it gives them just a bit more integrity so they hold together better. The cabbage is going to be thoroughly wilted and very soft, too, so just be aware that it’s supposed to be that way. And it really doesn’t even taste like cabbage any more, it picks up so much flavor from the rest of the ingredients. When the dish is finished, you can serve the sauce as is or reduce it to thicken it up. We just served as is and it was delish, although thinner and not at all “gravy” like. Just a touch of white wine vinegar brightens it up at the end. Go by taste and add just a little bit; it won’t taste “vinegary” just better. Using all sale priced ingredients, this ran a bit over 10 bucks to make – with plain old everyday prices, probably close to 20. Watch for pork shoulder to be at a low in the fall, but watch, too, before any holiday in which ham is to be served, like Easter or the Winter Holidays. Something has to be done with the rest of the pork! See my post on Buying A Large Pork Roast, especially if all the store has are larger pork roasts and you want to cut it into a size to fit your family. When shopping for sausage, look for them on special, check for discounts and chuck them in your freezer. They’re ideal for the freezer because they don’t take up a lot of room! Every now and then, common veggies like cabbage, onions, and potatoes go on sale, but not often. In this case, I picked up several cabbages around St. Patrick’s Day, since cabbage keeps so well. The downside is that it takes up a lot of room in the fridge! Potatoes may be on sale around holidays, but your best bet is generally to buy them in 10-pound bags, use the more uniform ones for things like baked potatoes and the oddly sized ones for dishes like mashed potatoes, where size doesn’t matter. As far as bargain shopping for wine, if you’re the kind that can keep it around, shop the early spring sales that happen every year. Sign up for email alerts, don’t be afraid to check the bargain bins where larger shipments of “just decent enough” wine end up. You don’t always have to cook with the wine you’ll drink. That’s an oft-repeated lie, so to speak! And make friends with the wine expert at your liquor store. It will pay off; they can direct you to wines you might not know about at any price point. Optional, fit a wire rack in a sheet tray with sides. Liberally sprinkle the pork shoulder with salt and pepper, then place on the sheet tray and refrigerate, uncovered, 8 hours or up to overnight. Heat a large Dutch oven over medium-high heat. Add a little oil to the pan, then the sausage and brown the links on both sides, about 5 minutes per side, until well browned. Remove the sausage to a large plate. If needed, pat the pork shoulder with paper towels to dry. Add to the Dutch oven, using oil as needed and brown on all sides until deeply browned, about 5 minutes per side. Remove the pork to the plate with the sausage. Add the cabbage and onions to the Dutch oven and sprinkle with a little salt and pepper. Cook over medium heat until the vegetables have softened slightly, about 5 minutes. Add the wine, mustard and caraway seeds and cook until the wine has almost evaporated 6 to 8 minutes. Return the pork to the Dutch oven, arrange potatoes and sausages around it and add enough stock to bring the liquid level to about halfway up the roast. Bring to a simmer and then cover and reduce the heat to low. Let braise until the pork is very tender, about 3 hours, checking liquid level now and then (about halfway through the cooking and then about a half an hour before you expect it to be done) to make sure it isn’t in danger of drying out. May be brought to a simmer, covered and placed in a 325-degree oven for about four hours or so instead of cooking on the stove. Remove the pork and sausages and potatoes to a large serving dish then remove cabbage with a slotted spoon and add to the platter. Shred the pork using two forks. Add a touch, to taste of the white wine vinegar to the sauce, add salt and pepper if needed. Pour the sauce over the top and garnish with fresh parsley. Serve with creamy horseradish sauce alongside. For a thicker, richer sauce, strain the liquid from the Dutch oven and reduce the sauce over medium heat in a small saucepan until it reaches a thin gravy consistency, 7 to 10 minutes. Note: If you’d like, add a little dried rosemary or thyme along with the caraway, rosemary if you use an Italian sausage, maybe 1/2 a teaspoon, thyme for others, maybe a teaspoon. I’ll be sharing Braised Pork Roast with Sausage & Cabbage at Fiesta Friday #269. It’s co-hosted this week by Moi and and Ai @ Ai Made It For You. This entry was posted in Click here for Bargain Meals, Click here for Fabulous Food Posts and tagged Alcohol, Cabbage, Chicken Stock, German, Pork, Pork Shoulder Recipe, Potatoes, Sausage, smoked sausage, Vinegar, Wine. Bookmark the permalink. Oh yum!! I actually love slow cooking all year long since becoming a mom. Sticking it in the oven and forgetting about it = my kinda cooking haha. Gosh yes! And it’s nice to have meals that kids and babies can eat, too, a little of this, a little of that! My kind of dinner any night any time of the year. 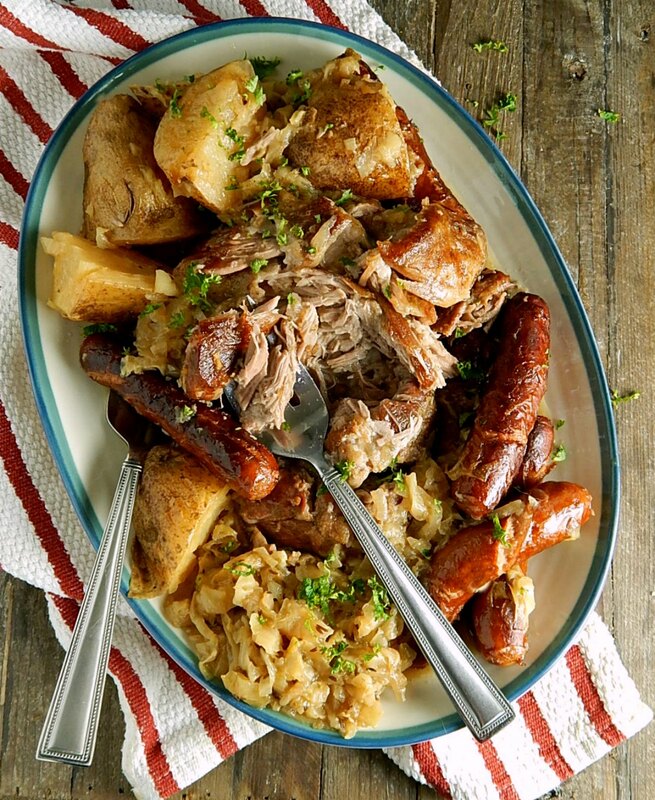 We love our pork over this way and then add cabbage with potatoes, pure yum. This dish would set proudly on any a Swedish table. Nice one Mollie. I grew up with this kind of thing, but no cabbage and no wine! My daughter told me cabbage is getting trendy…which to me translates as more expensive. Jhuls, the potatoes were pretty amazing! My pleasure! Looks like a hearty meal to keep us warm! That does look good! Worth keeping in mind in case the weather breaks (it’s been so warm here that we’ve basically been living outdoors and are in full barbecue mode 😁). It won’t be long, here! We had a couple nice days then it dropped back down to below freezing. We’re still working on the yard, though! 🙂 Spring fever has started! I agree. I’d like to make red chile pulled pork for tamale filling the next time I find it on a good sale.